Mol. Cells. Jan 31, 2019; 42(1): 8-16. Mol. Cells.Jan 31, 2019; 42(1): 8-16. Received November 26, 2018; Accepted December 29, 2018.
, (2012). 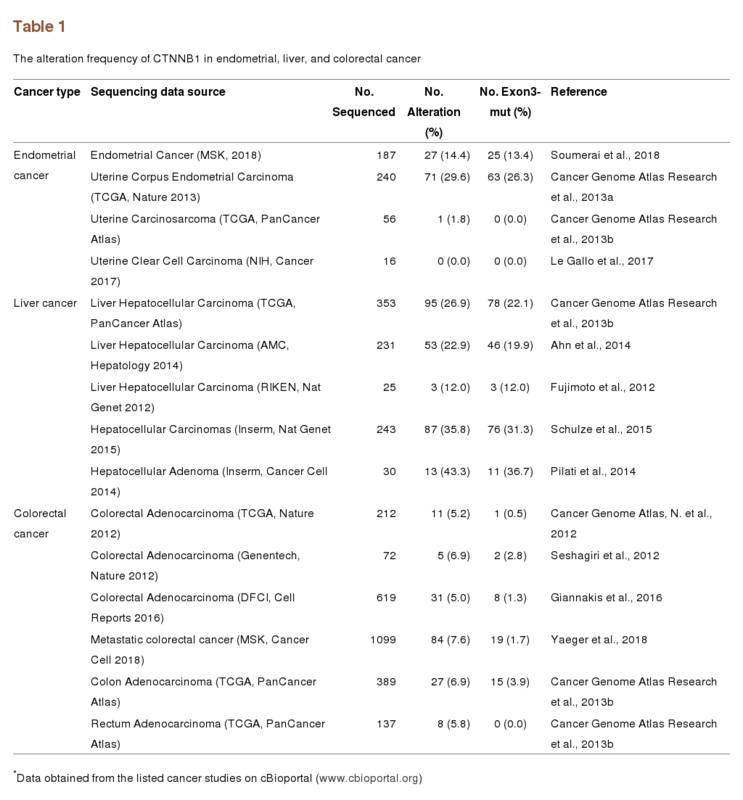 Comprehensive molecular characterization of human colon and rectal cancer. Nature. 487, 330-337. Kandoth, C., Schultz, N., Cherniack, A.D., Akbani, R., Liu, Y., Shen, H., Robertson, A.G., Pashtan, I., and Shen, R. (2013a). 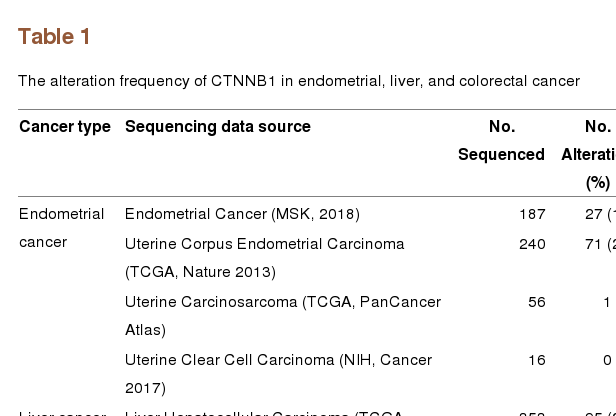 Integrated genomic characterization of endometrial carcinoma. Nature. 497, 67-73. Weinstein, J.N., Collisson, E.A., Mills, G.B., Shaw, K.R., Ozenberger, B.A., Ellrott, K., Shmulevich, I., Sander, C., and Stuart, J.M. (2013b). The cancer genome atlas pan-cancer analysis project. Nat Genet. 45, 1113-1120. Liu, Y., Patel, L., Mills, G.B., Lu, K.H., Sood, A.K., Ding, L., Kucherlapati, R., Mardis, E.R., Levine, D.A., and Shmulevich, I. (2014). Clinical significance of CTNNB1 mutation and Wnt pathway activation in endometrioid endometrial carcinoma. J Natl Cancer Inst. 106, . Polakis, P. (2012b). Wnt signaling in cancer. Cold Spring Harbor perspectives in biology. 4, . (A) Wnt-off. 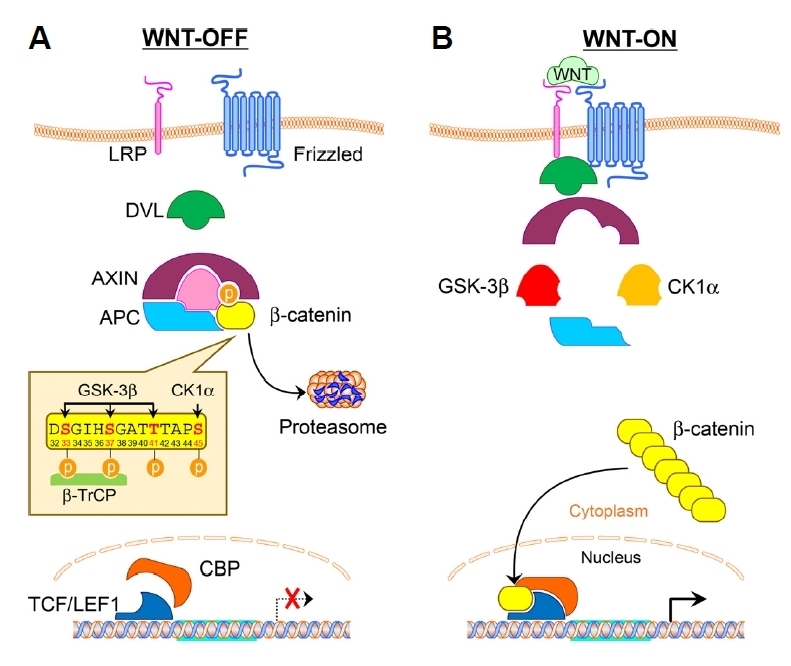 In the absence of Wnt stimulation, β-catenin is phosphorylated by CK1α and GSK3β followed by ubiquitin-proteasome mediated proteolysis. (B) Wnt-on. 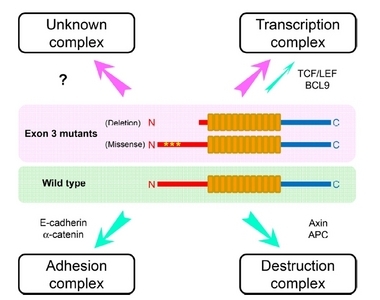 Upon Wnt stimulation, the destruction complex is not functional, so the β-catenin protein is translocated into the nucleus and acts as a transcriptional co-activator to regulate oncogenic target genes. APC, Adenomatous polyposis; DVL, Disheveled. Data obtained from the MSK-IMPACT pan-cancer study on cBioportal (www.cbioportal.org). (A) A schematic diagram of the β-catenin protein and mRNA. UTR, untranslated region; CDS, coding sequence; ATG, translation start codon; TAA, translation stop codon. 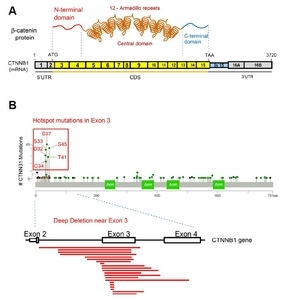 (B) Exon 3 hotspot mutations of CTNNB1 are marked on the lollipop plot downloaded from the MSK-IMPACT pan-cancer study on cBioportal. 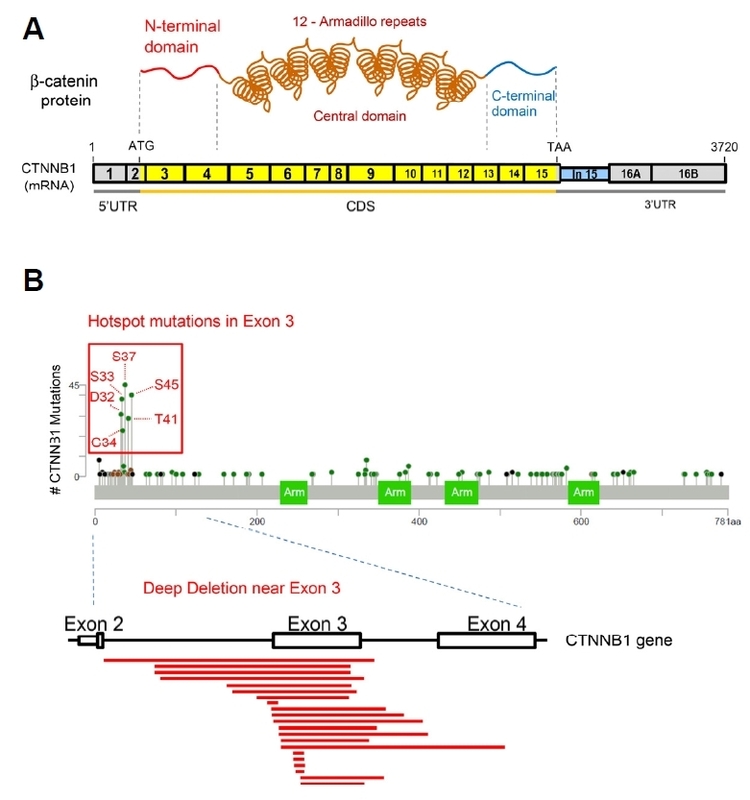 Deep deletions near Exon 3 of CTNNB1 pre-mRNA are indicated as red lines. Deletion data were obtained from metastatic colorectal cancer study (MSK) on cBioportal. The green indicates wild-type β-catenin protein and the pink indicates exon 3-mutated β-catenin proteins. 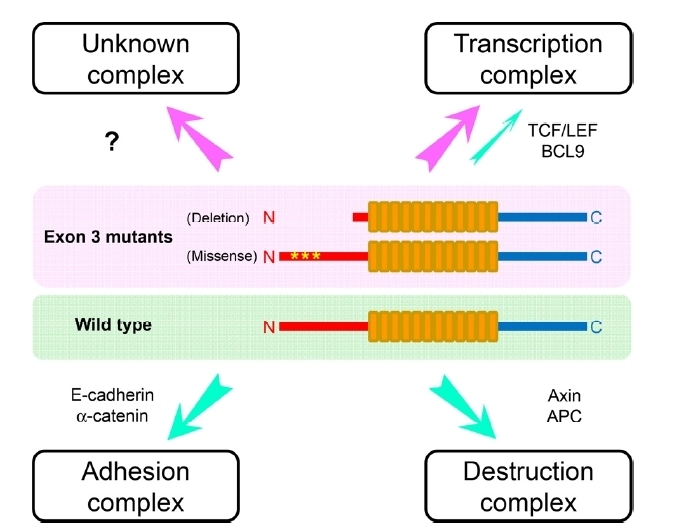 In addition to the adhesion, destruction and transcription complexes with the indicated proteins, additional unknown protein complexes are likely to be formed by the mutant β-catenin proteins. 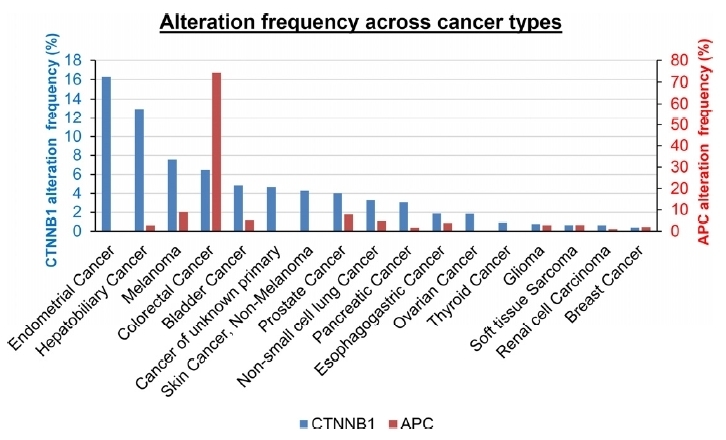 *Mutation data obtained from Cancer Cell Line Encyclopedia (Novartis/Broad, Nature, 2012) on cBioportal (www.cbioportal.org).